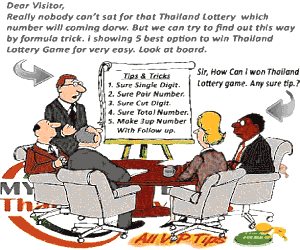 The lottery is taken very seriously in Thailand as it is the only kind of gambling allowed here in Thailand. The system is very different compared to the western world. In Thailand, you’ll have to get lottery tickets from agents within your own 6 digit number. Which receive these tickets from retailers. Usually, lottery tickets are drawn twice a month, which is the first day of the month and the 16th. Every ticket costs 80 baht. Each ticket has 2 parts, the top, and the bottom part. It is not possible to buy just one part as they come in pairs. However, if you win, your prize is doubled. Every ticket has 6 single digits, which you’re able to choose when you buy one. When the numbers are drawn live on national television, there are probably more than 20 drawn every time as they’ll have to draw all of the numbers according to the number of prizes stated.